There was a 0.2 percent overall average rise in 2013 crew costs 4.1 percent, while in the tanker and container ship sectors the compared to the 2012 ? gure. By way of comparison, OpCost overall reductions in costs were 2.1 percent and 3.4 percent re- revealed a 21 percent increase in this category in 2008. Tank- spectively. The most signi? cant increase in stores expenditure ers overall experienced an increase in crew costs in 2013 of 1.8 was that recorded by the operators of tankers in the 5,000-to- percent on average, compared to the 2.3 percent fall recorded in 10,000 dwt range (6.0 percent). Handysize bulkers, this following a 4.8 percent reduction for owners and operators will stop pursuing the sort of sound hus- 2012. Expenditure on crew costs remained unchanged over bandry which competition and regulation demand. 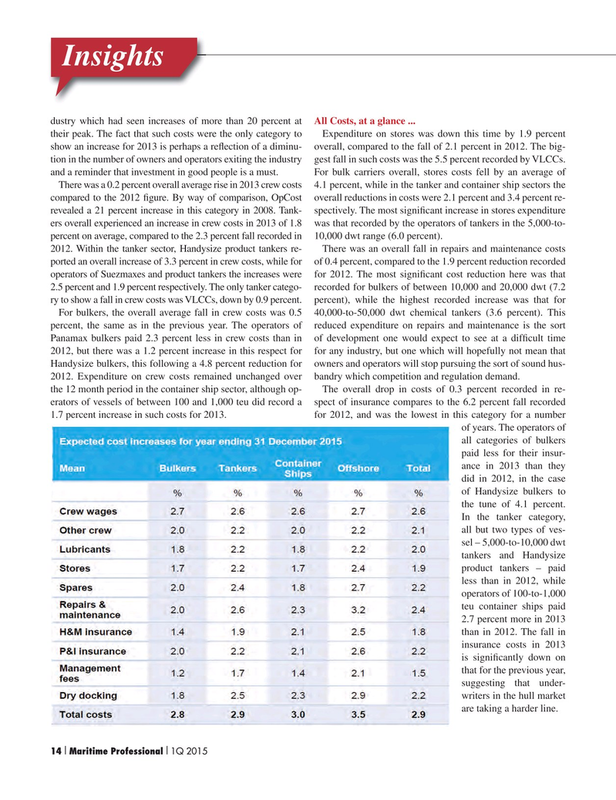 the 12 month period in the container ship sector, although op- The overall drop in costs of 0.3 percent recorded in re- erators of vessels of between 100 and 1,000 teu did record a spect of insurance compares to the 6.2 percent fall recorded 1.7 percent increase in such costs for 2013. for 2012, and was the lowest in this category for a number of years. The operators of all categories of bulkers paid less for their insur- ance in 2013 than they did in 2012, in the case of Handysize bulkers to the tune of 4.1 percent. In the tanker category, all but two types of ves- sel – 5,000-to-10,000 dwt tankers and Handysize product tankers – paid less than in 2012, while operators of 100-to-1,000 teu container ships paid 2.7 percent more in 2013 than in 2012. The fall in insurance costs in 2013 is signi? cantly down on that for the previous year, suggesting that under- writers in the hull market are taking a harder line.